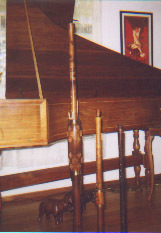 The shawm is the immediate ancestor of the oboe. 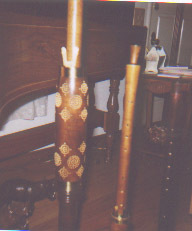 Both are double-reed instruments having a conical bore, lacking a hole for the left thumb. 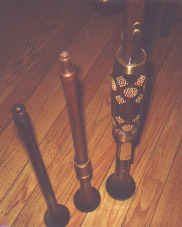 The Renaissance-era shawm came in a variety of sizes, from the sopranino (in F or G) to the "standard" soprano in C(the dark instrument at the far right), the more melodious alto (in F or G) (middle), tenor, basset, bass, great bass, etc. The instrument at the left is a C tenor with an extended range (down to G2): sizes from tenor on down were frequently made with the range extended a few notes. Fortunately, this one is made with a joint (right above the fontanelle), so that it fits into a case of reasonable size. The keywork on Renaissance instruments was often covered by an elaborately perforated guard or fontanelle. This served to protect the relatively fragile keys, while permitting the sound to issue (perhaps muted to counteract the possibly rough sound of the larger instruments). On this tenor, the two swallowtail keys (RH4) provide low C and B, while the two thumb keys (RT) provide low A and G (no chromatics there). In the picture above, you can see the two thumb keys (little more than simple levers): the lowest pad (or two?) is covered by the metal extension of the fontanelle. 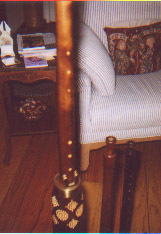 The extension gives this shawm one step lower than the heckelphone, and a third lower than the bass oboe. Only having had the horn a short time, I haven't developed any proficiency on it (and the fingerspan takes a bit of getting used to). Nevertheless, here is a rough MP3 file. After the ditty, the scale is G descending to low G (harmony added on the second take). Where can one find their own shawms? The Early Music Shop carries a variety, as do the von Huene Workshop, Antique Sound Workshop, and Courtly Music. For the great bass shawm (with extended range, an octave below the tenor pictured above), you need to see Keith Loraine.